Big Cat Tiger Has Most Unbelievable Friendship With Pet Dog… Just Watch, This Is Most AMAZING! This unique friendship is truly incredible and features a real tiger and dog. They both get along great and even lick each other with love because they’re best friends! This amazing big cat has the sweetest friendship you’e ever seen with a dog – I don’t think I’ve ever seen such a majestic big cat being so friendly to someone that is not related to the cat family at all – AMAZING! I’ve never seen anything like this, it’s truly amazing—SHARE this with your friends! 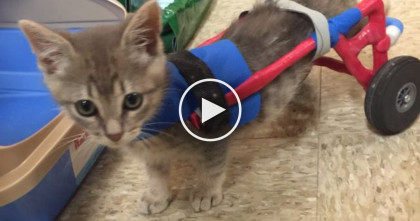 This Hungry Kitten Wants Milk, But Makes The Weirdest Noise Ever… What In The WORLD?! Poor Little Orphaned Kitten, Only One Week Old Nearly Died, But Then… Just Watch This Amazing Story!